The burial register contains details of those interred between the years of 1799-1854 in Markinch Churchyard and the list below was compiled by members of Fife Family History Society (FFHS) and re-formatted into this current version by Ian Gourlay, a member of Markinch Parish Church. We thank the FFHS and Ian Gourlay for compiling this information. In the early part of the 19th century many surnames were not spelled as they are today and the registrar appears to have recorded many names exactly as they were pronounced to him. There are inconsistencies in the spelling of names within the same entry – examples of this are to be found particularly under the surnames Hutcheson and Hutchison where the ‘e’ and ‘i’ are regularly transposed, although there are several other examples throughout the text. The register also records the burials in the new (Northhall) cemetery. The first interment there was No 41 for 1854 – William, son of David Johnston, farmer at Bighty. The Old Church-yard was shut on 11 Feb 1856 and the last interment was No 8 of 1856, Robert, son of William Stenhouse at Plaisterers, who was buried 3 Feb 1856. Typescripts of the Churchyard burials from 1853-1856 and the Northall Cemetery burials from 1854 are to be found in the Cemeteries Department at Unicorn House, Glenrothes. Note: Some surnames starting with the letters ‘S’, ‘T’ and ‘W’ are missing from the record. FFHS has been informed of the omissions. 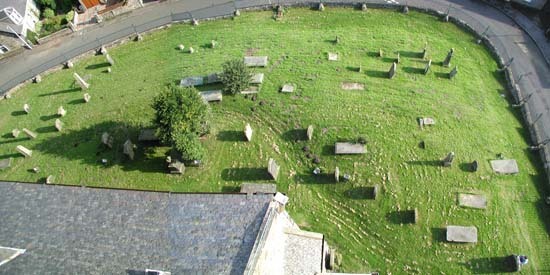 This photograph was taken from the top of the church tower looking straight down towards the south side of the church graveyard. Please note that all the formal records (for the three Markinch churches) are lodged with New Registrar House in Edinburgh. We only hold the baptismal register that is in current use. Writer: The Rev J Sieveright, Minister. Markinch – Volume 9 page 655. Published by Oliver and Boyd, Edinburgh and London in 1952. 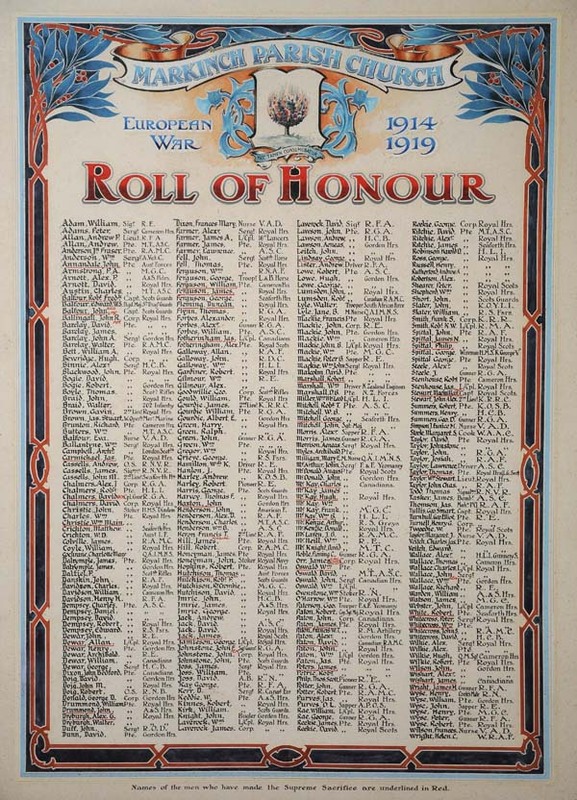 Photographs of the War Memorials and Roll of Honour for Markinch Parish Church (St Drostan’s), Balbirnie UF Church and Brunton UF Church (St Mark’s) which are all located in the church sanctuary have recently been added to The Scottish War Memorials Project website. The individual Memorials for members of the Balfour family have also been included HERE. The Scottish War Graves Project website may also be of interest.